Three lovely hikes that offer stunning vistas and refreshing rewards at the end of the trail. Difficulty: Moderate; 7.2 miles round-trip, 2,000-foot elevation gain Location: About 90 minutes northeast of Seattle on Mount Index via Highway 2 past Gold Bar. Nearest town: Gold Bar, 8 miles. Northwest Forest Pass required; dogs must be on a leash; Map and more info at wta.org. If you love waterfalls and alpine lakes, the hike up to Lake Serene might be your idea of heaven. The first half of the hike is innocuous enough, with a low grade up an old logging road that winnows down into a trail. Taking the short spur trail to Bridal Veil Falls may have seemed like an option when you were lacing up your boots, but its thunderous roar—audible from a half-mile away where its spur trail breaks off from the main route—makes visiting imperative. The boardwalk at the base of the falls is an ideal spot to cool off in nature’s finest shower. After shaking dry, lake lovers should soldier on and conquer the majority of the hike’s 2,000-foot elevation gain over the next mile and a half, switchback after switchback. Just when you think you couldn’t drink in any more natural beauty, you are standing on a boulder at the edge of Lake Serene, the quintessential alpine lake of Washington’s Cascades. 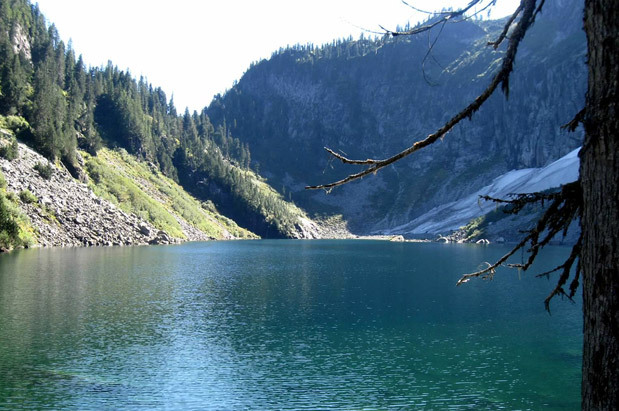 Luckily, the hike up to Lake Serene is for day-trippers only; otherwise, you might never leave. Location: About three hours northeast of Seattle on the North Cascades Highway, Washington Pass Overlook. Nearest town: Mazama, 22.5 miles. Northwest Forest Pass required; dogs prohibited; Map and more info at wta.org. Not every alpine lake requires a rigorous hike to be reached. Grandma and the kids can come along on the one-mile, handicapped-accessible trail to the sublime shores of Rainy Lake in North Cascades National Park. Walk through subalpine forest and wet meadows with the sounds of trickling water and chirping birds providing a tranquil soundtrack. You’ll arrive at a lakeside observation deck, which features an interpretive sign explaining how glaciers form lakes, and a couple of benches from which to watch geologic time unfold. Everyone will want to dip toes into the water, but probably not more; this is a glacial lake, after all. But if it’s a warm summer day, you might just take the plunge anyway. For a high mountain lake that you—and your kids—can jump into, along with huckleberries aplenty (in late August) and views that will take your breath away, pick up this segment of the Pacific Crest Trail. You’ll parallel the highway for the first mile—but don’t despair; you’ll be walking through gorgeous valleys soon enough, on your way to Sheep Lake, just two and a half miles in. Consider a cooling dip and a snack here; the final mile of your journey—to the ridge of Sourdough Gap and the towering vistas below—is steep indeed. Be careful, especially with children, at the top: A sharp 500-foot cliff falls away on the other side, opening up to spectacular views of Mount Rainier’s Emmons Glacier and the Crystal Lakes basin.